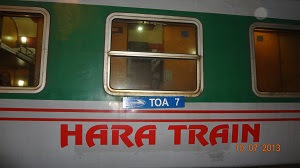 HaRa Express Train has 2 carriages (the 1st and 2nd carriage in the SP1 and SP2). Each carriage has 7 cabins – 4 berths which can set up to Deluxe cabin - 2 berths. The enchanting luxury, the comfort facilities of the wood-paneling cabins will make your stay in these carriages memorable. Passengers are to hold the best opportunity to relax or simply let the beauty gliding over your spacious windows. Luxury, inspiration and refreshment are main character of these carriages. Deluxe cabin is decorated with some items such as 4 Bottled waters, Wet Towels. When turn to Deluxe 2 beeths cabin cabin, customers will have other items like beer, soda, crackers. HaRa Express Train is wooden carriage, soft sleeper A/C cabin with soft deluxe 2 berths, 4 berths deluxe cabin and two toilets at either ends. Each berth is equipped with individual reading lights, baggage storage and spacious trunk for suite case and hand luggage. Especially, Hara carriage stays nearly the restaurant of the train. Therefore, it is very convenient for customers to eat here which provides a variety of food and drinks. A Private Hara Deluxe 2 berths cabin create an intimate space for couples with 2 berths only. These cabins are lovingly designed to for those who desire to have the privacy with remarkable interior decor.